What follows are screen storm door problems and fixes that my visitors have sent in. With luck, you will find the same problem that you are experiencing with your door here. If, not go to the bottom of the page to find a place to submit your own question with pictures if you need to. How to get the glass out of a storm door ? I have a swinging screen door that has a square section screened on the outside and a double hung (up down) sliding window with plastic instead of screen material inside that square section attached from the back of the door. The double hung window seems to be an insert that fits in the square screen door that is held in by screws but when I take the screws out one corner is loose and will push out but the other three sides are stuck. I'm guessing the insert that holds the window in may be glued in some way. Any ideas on how to get that window frame out so I can replace the plastic material? I need to repair the window frame on my Pella Rolscreen Storm Door. The frame is coming apart on the glass.I cannot find any assistance from Pella or where I bought it. How do I take the window out of the frame??? Quite often storm doors have foam rubber behind the plastic frames that allow you to pull the window to the left or right and get enough space for the window to pop out of the frame. Would be really good if you could post a digital picture because that might give more clues as to how it comes apart. I have to repair the screen in the lower part of my door. I have removed the glass sliding pane, now how do I remove the fixed lower unit without breaking the upper glass pane. Push up on the upper glass until it moves about 1/2 inch up into the door frame, then pull the bottom of the glass out a little toward you. Pull down on the glass and it should slide out. If the glass has been there for many years, it can be tricky. Just be patient and work it loose gently. I have a question about taking an old aluminum window frame apart. I have looked on 3 to 4 dozen websites and can't find the answer. My window frame is one of two that are in an old screen door. The bottom third of the door is a metal panel. The frame does not have any screws in the corners. It does have four dots on every corner. I thought I have heard that I should drill out the four dots on the top right and bottom left corners and then I will be able to slide the frame apart? Once apart and I replace the glass, how will it go back together? The dots are made when the factory uses a metal punch to lock the frames together. You are right about carefully drilling out all the dots. The frame will come apart. When you reassemble the frame after replacing the glass, just use a pointed metal punch and a hammer and make new dents, just deep enough to make the frame grab into the corner. You need to punch the corners on a hard surface, and be careful not to strike too hard, or the new glass may break. Oversized Screen door Catch or Latch? I have had a very difficult search for an oversized screen door catch or latch that will fit our camp/cottage door. Regular screen doors are about an inch thick or so, ours is closer to 2 inches and so the stardard sized, spring mounted catch that helps keep the door closed will not work as the arms or fingers on the thing do not go around the door. I'm interested in some direction to a manufacturer that may specialize in this type of hardware. Thanks for your direction, love your website. The wind blew open my brand new storm door yesterday. now it wont close. the bottom of the door now seems to come out about an inch to far to close. Have someone hold the door open near the top of the door. Then push gently on the bottom of the door to see if it you can straighten it. With luck the it should be possible to make the door close properly again. Sometimes when the door gets blown open the corners break. If the door feels loose when you try to straighten it, then a corner may be broken. If there is a broken corner, the store you bought the door at may be able to tell you if the manufacturer has spare parts. We bought a screen door at Menards a few years ago. The bottom white piece has broke, leaving about a 3 in gap for cold air, mice, bugs, etc to get in. On the outside is a gold piece that is ok. I am thinking this white piece slid up under the gold piece and came around and screwed to the inside. I have tried to look on the internet and cannot find the piece. No where on the door does it tell me the brand. All I have is 3AXG 200 36x80 WHN 8175 to go by. When I go to Menards they tell me they don't sell screen parts and I have to go online. It sounds like the piece you are talking about is the doorsweep that keeps the bottom of the door sealed. Storm doors come in different thicknesses, from 1" thick to 2-1/2" inches thick. You need to know how thick your door is to get a door sweep that fits. Once you know the thickness of the door, check with your local door suppliers, not the big box stores. They might be willing to sell you a door sweep that fits. Lowes and Home Depot have door sweeps that might fit. At least you return one of theirs if it does not. My sliding glass door has a storm door mounted over the frame. I tried to remove the sliding screen off the track but the storm window is blocking the removal. Will I have to remove the storm window? Sometimes the bottom track belonging to the storm is removable. Look for screws holding the track in place and try removing them. If the storm door does not have a removable track, you may be able to repair the screen door without removing it. Just clamp new screen cloth all around the door and roll in the spline all around. It's a bit awkward, but not impossible. So long as you can access the spline channel all around you are good. If the screen door is still not accessible the whole storm door will have to be removed to get the screen door out. I have a storm door in our sunroom. There are two separate window panes, the bottom one is removable/sliding. In the summer, I would like to remove the solid pane and replace it with a screen. The area is roughly 27" x 32.5" and it has the typical sliding tracks for easy removal. Your local glass shop should be able to make up a frame. 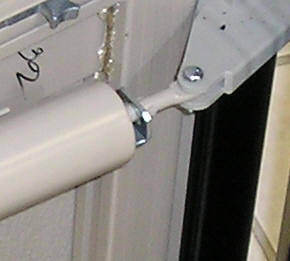 Most storm doors use 1/4" extruded aluminum frame. Storm door screen. I do not want to take the whole door out in order to lay it flat to add the new screen so is there anyway to remove the screen section of the door after removing the sliding glass section?? Or do I have to try and replace the screen with the door in the upright position. If a storm door is very old or painted over its often difficult to pull the screen frame out without damaging it. Check the instructions on the Storm Screen Repair page to find out how to do it in place. Grandkids are hard on everything!! First year in a travel trailer we bought on a permanent sight. Happy to share it with kids & grandkids. After 1st weekend needed to clean the rug, and the screen sliding door was off the hinges. Is there anything sturdier than the standard issue door? What about a heavier door that's only part screen; is there any such thing? We're in Wisconsin, so leaving the glass door open is not an option--bug wise. Don't want to kill the kids, so hope you can help! If you could send some pictures of the existing door it would help a lot. I have seen sliding screen doors that were converted to being a hinged door. I would like to know how this is done. Hi, where can I buy 4 new die cast aluminum corners for a knock down door. The originals are 4.25 inches on each side (outside) and 7/8 inch wide. Three of the originals are in bad shape and either cracked or bent from having the chain and Pneumatic closer removed during a wind storm. 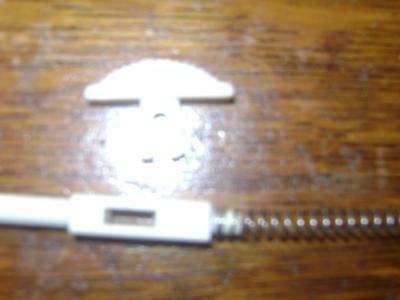 The corners appear to be put together with a plastic piece to hold the joints together. These two plastic pieces broke. You can replace the corners in most screen doors. Modern doors use sometimes use plastic corners which have the same dimensions as the old metal corners. If you can send me a picture of your old corner, I can figure out if its replaceable. My storm door frame is warped and the rubber at the bottom is broken and parts missing. The glass is in excellent condition. Can just the frame be replaced and what would be the estimated cost? Thanks. The corner pin on my screen door storm window broke. I was wondering do i have to replace the whole frame or just the corner pin? Storm window frames are often staked or crimped together at the corners. Some of them are even welded together. Sometimes you can drill out the staked area or crimped metal or just loosen up the frame in the corner with a flat blade screwdriver to get the old broken corner out. Many glass shops will carry replacement storm window corners. I have a screen door, not a sliding one but a storm door with hinges. I locked myself out of my house and I had to pull the screen out of the storm door to get back in. Now the frame for the screen is broken and the screen is ripped a little too. The frame that held the screen in is metal. How can I fix this? Can I do it myself or should I take the screen somewhere? How much would it cost, to do it myself or to have it done? Thanks! 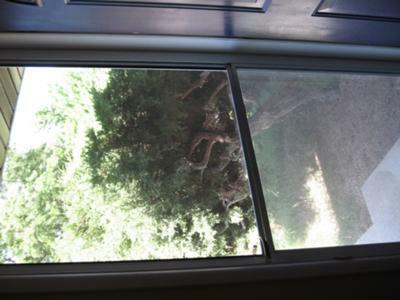 Most glass shops should be able to build you a new storm door screen frame without any problem. Take the old screen to the glass shop, even if its bent. It will help them get the size right. About five years ago we had storm doors put on the house. The windows in the door have little plastic trackers to hold them in place at the top. They have broken and we are trying to find replacement parts for them. Any ideal where we might find some. Why will the windows in my old aluminum door not stay up? I have an old aluminum storm door with 2 sliding windows. The upper can slide down and the lower can slide up. I'm having trouble with either one staying up. The springs (I don't know what they are called and that's part of my problem I don't know what to search for) 'seem' to be strong but I thought I would try replacing them anyway. Can you tell me what this piece of hardware is called? Or can you tell me what might be wrong with the windows not staying up. I'm having trouble with the upper window catching in the uppermost position. And the lower one tends to catch but it falls down on its own sometimes. Also, the upper window has to be screwed down to keep it from falling down which makes it where I cannot open the lower half. Like I said it's old and I would consider replacing but I just painted it and put solar screen over it to match the rest of the exterior. Currently, the windows are being kept in the up position with a piece of trim. Thank you for your help. There are usually 2 spring loaded panel clips or spring bolts on either side of the movable panels. These panel clips break making it impossible to set the window at the height you want it. Theres a lot of different shapes and sizes of panel clip so it would be great if you can send me close up pictures of the ones you have. Our screen windows are 10 years old and the latches that hold the screens in are brittle and breaking off, thus causing the screens to fall out. The screens themselves are in good condition and I would really not like to replace them. Is there a latch replacement kit or a means of securing/locking the screens in ? Who invented those screen windows with little pins and clips?! Hi, we just purchased a house that has decent enough double-hung windows, but the screens are ridiculous. They have two little metal pins at the top, and somehow the screen needs to be pushed horizontally out the window, turned vertical and hung on these two tiny pins through notches at the top (and good luck getting them in there) then the bottoms are "secured" with flimsy plastic clips that are attached to the screen with a thin plastic tab. The previous owners must have had problems getting them in and out too, because every screen is dented, the metal pins are bent in the windows, and most of them are missing that plastic tab that secures them to the frame, so they just flap in the breeze. Is there an easy way to take them out and put them in-- and I'm just not getting it? Or is there another type of screen out there that might work better ? I have a white aluminum screen door that has two glass panes and one screen pane. I recently tried to raise the glass panel over the screen so I had glass on both top and bottom. The problem - the glass pane has been in place for so long (in florida - lots of corrosion) that the gray 'pot metal looking little slider latches' that go into slots in the frame are broken off. Is it possible to obtain these parts? If so where? I do have the little springs and clips that hold them in the panel. These little latches are called "fix clips" or "panel clips" and there are dozens of different styles. If you can post some photos of the the kind you have I will see if I can locate them for you. I have an older storm door. I need to take the glass out to replace it with the screen each season. There is a 1 cm hard plastic strip I pry out using a screw driver and hammer. I need to replace this strip. It is U shaped (three sided) and about 5 feet long. Would you know where I can find this? These strips are unique to the manufacturer of the door and are hard to find. Many doors use small metal angle brackets to hold in the glass or screen, and these are easier to locate. You would need to drill a few holes in the frame around the perimeter of the screen and then install the small brackets. I have a storm door on my back door. There are little plastic clips that keep the window in the track while sliding the window up and down. Sorry dont have any pictures. Not the the sliding ones that you move with your fingers. The ones on the top of the window. Does anyone know where I can buy new clips? The window is now held in with duct tape. I have a screen door with glass on the bottom and screen on top with a sliding glass panel that goes all the way up and locks in or slides down to expose the screen. However the little plastic slides that hold the glass panel at different levels are broken. Can I replace those without buying a whole new door? Absolutely you can replace them. They are called "storm panel clips" and you might be able to find them at some hardware stores. But they are stocked by suppliers like CR Laurence and Swisco. You might have to phone these companies to see who carries them in your area. If you remove the sliding window and flip it upside down, you should see a tiny access hole above the location of the clip. If you push down through this hole with a small screwdriver the panel clip should slide right out. Be prepared to catch the spring and the tiny retainer pin as you slide it out. Take the panel clip with you to the window repair store to get the right replacement. and slender that goes through the window frame then the springs help lock the windows in place on the track. Bought a condo with a screened patio. maker and installer unknown. 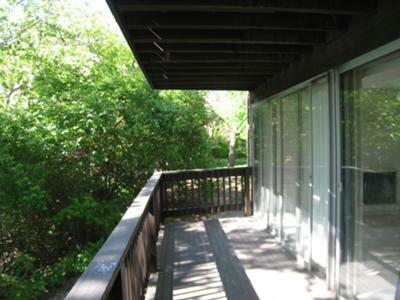 each of 6 panels has 4 sliding windows (plastic not glass) screening on outside is one piece. Do you have a supplier for decorative storm door Grills ? Also How much is the screen repair business kit ? Hi, I've just replaced the front door storm door screen again. Where can I find the decorative screen door grills made out of aluminum that I used to see on doors 40 years ago? I am also looking for the decorative aluinum storm door grilles. The new mesh looking ones they have now are UGLY!! So far I have had no luck finding them. Window won't stay up on retractable screen storm door.